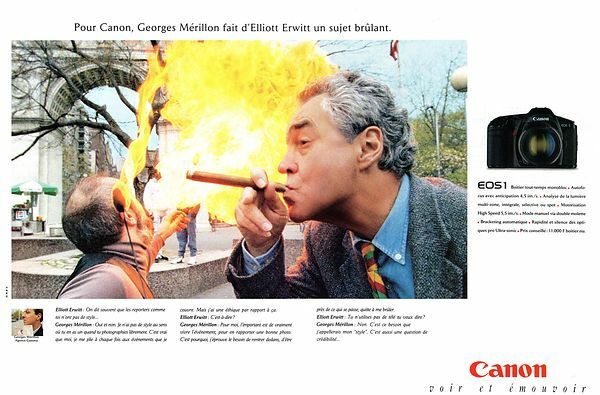 In 1992 Canon had the good idea to order cross portraits of photographers. I went to New York to share the exercise with Elliott Erwitt. The advertising agency had asked everyone to stay in their "world"! The time was agitated and I was labeled conflict photographer. For Elliott, it was quite simple: Some calls to dogs rental agencies and appointment is taken with a German mastiff and a poodle in Central Park for the photo. For me it was more complicated: No protest or revolution set in New York those days. 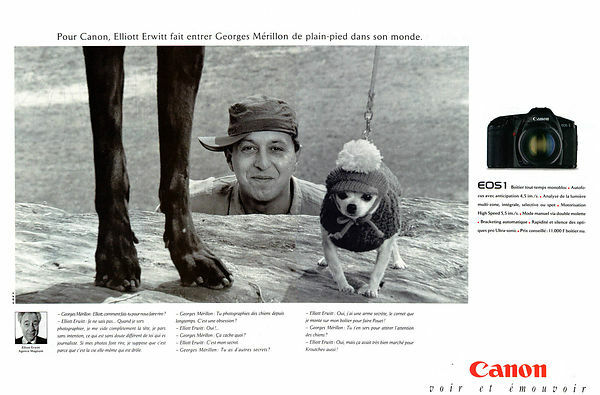 Erwitt is a cigar lover. I submit to him the idea to light one with a fire-eater (I had seen one the day before on a place in Manhattan). It remains only to find ione! Do not worry says Elliott. He calls for a rental player agency that had fire eaters in their book and also handles requests for authorizations to be filed with the police and firefighters to be able to do this portrait on Washington Square. The titles and lyrics are quite funny and neither one nor the other to ask fatherhood!! !